Glad you didn’t! Low hanging fruit! Is there any scientific evidence in regards to different body type/weight/size playing a factor into some of those numbers such as 60-90 g carbs/HR? Obviously runners, and especially trail runners come in all shapes and sizes. I’m on the lower end of that range myself (let’s just say Men’s size small for all my gear) – and I find that what works for me is always on the lower range of most of the recommendations I see online or hear on podcasts. That goes for both fuel and water intake. To me it would logically seem that naturally bigger runners (not overweight) would need to take in more calories. I know everyone needs to experiment and practice on their own, but would you say that is true, somewhat true, or totally false? I.e. all things being equal (training, nutrition, fueling practice, etc.) would there be any difference on average between smaller vs. larger runners in the amount of fuel intake that can or should be taken in? Thank you for your thoughtful question! Yes this can vary by size, the maximum capacity known is that 60-90 grams of carbohydrates per hour but you’re right there are generalized by kg guidelines as well. The consensus appears to be approximately 0.7 grams of carbohydrate/kg of body weight/ hour. So for example I weigh approximately 59kg (130lbs), and that would put my base recommendation around 41 grams of CHO/hour. This recommendation holds down to about 30grams/hour (42kg person, 92 lbs). If you must take NSAIDs I would recommend Celebrex – it’s a selective Cox2 inhibitor so should cause less GI issues. Really excellent – thanks for pulling all of that together so well into some good basic advice! Super to have some science behind the infamous GI ultra disasters! Maybe I missed this in the article, but is there an explanation for why sweet carbs (including drinks, gels, etc) stop being palatable (at least for me) after maybe the 50k to 50-mile mark, after which only solid and/or savory foods do not elicit immediate puking? I’ve survived the back half of 100s on nothing but broth and noodles, and at other races beyond 50 miles have wretched instantly on Coke but can then scarf down grilled cheese like its school lunch. I did share some miles with a physician at one race who insisted that some fat and protein helped the carbs to digest better (maybe by slowing absorption?). You might try Tums. I had the same problem as you – and to me, it was a problem because those fulfilling foods are hard to eat, transport, and digest. The Tums prevent the acidic/sour stomach that makes carbs seem puke-y and whole foods seem attractive. Pepto pills also work, if you’re not into the chewable antacids. Additionally, ingesting only carbohydrates (which are often sweet for sports nutrition) you can try to use products that have a little bit of added fat or protein which would create a savory flavor and can aid in feeling more satiated as well. Fats and proteins are both digested and absorbed differently that carbohydrates because fats and proteins are not water soluble like carbohydrates. 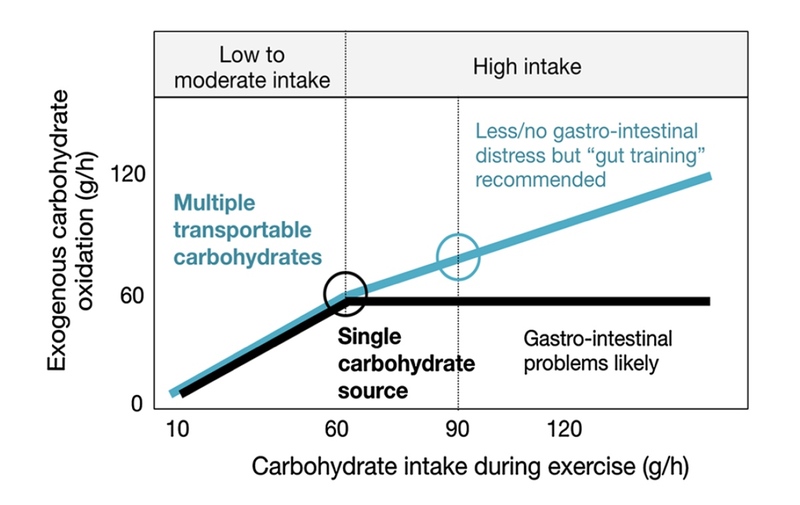 This is why carbohydrates absorb more easily. The Dr. was likely referring to the effects of ingesting fat and protein with carbohydrates to potentially improve glycogen synthesis (post exercise primarily). Glycogen synthesis is how your body restores it’s muscle glycogen post exercise, and there is research to support that taking in a mixture of fuels post activity can help boost the rate at which that is completed, but that is slightly different than how your body is actively utilizing glycogen/carbohydrates during exercise. That’s wild Nick! There’s almost always a tipping point for me in a race where Coca Cola becomes my only option. I’ve fueled many of the last 10 miles of 100km+ races on soda. I also find bananas really easy to eat when everything else fails. 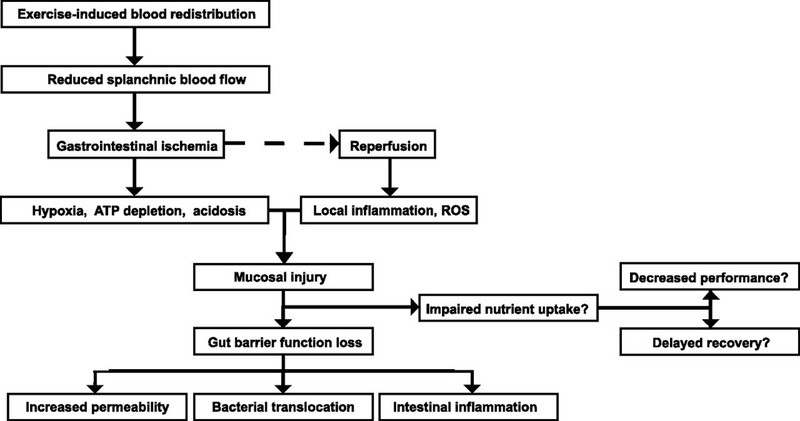 If splanchnic hypoperfusion is the “largest known contributor to GI distress,” as you say, is the only solution to it just to slow down to allow the blood to return to the GI tract? The answer is, sort of. Really anything to redirect blood flow to the gut. In a hot race keeping your core temp as cool as possible can keep your nutritional strategy alive, proper acclimation for altitude does the same thing. 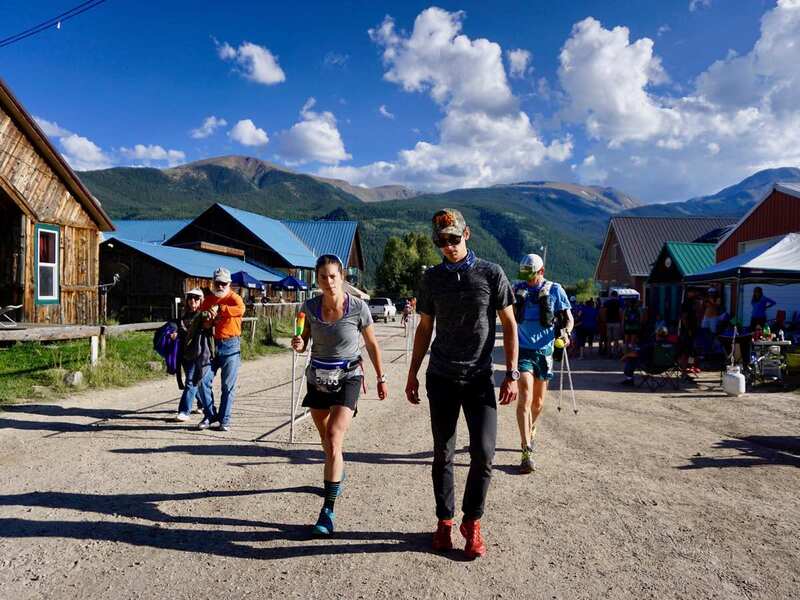 Or even selecting more easily digestible sources in the high heat of the day, or the high point of the course can help, allowing you to take in different sources at lower elevations or lower temps throughout the day (i.e. morning calories vs mid-day etc I’ll switch from gels, whole foods, to liquids, and then back as temp cools down). To save your race if it’s gone south sometimes taking that extra sit down at the aid station (maybe even 1-2 hours) to reboot get blood flow back and then carry on can restart your GI tract and turn your day around. Great article and excellent information. I’m curious – what would your thoughts be on the possible effect of food additives (like colouring) to the GI system? For example, is ‘blue’ Gatorade going to affect a runner differently than ‘orange’? 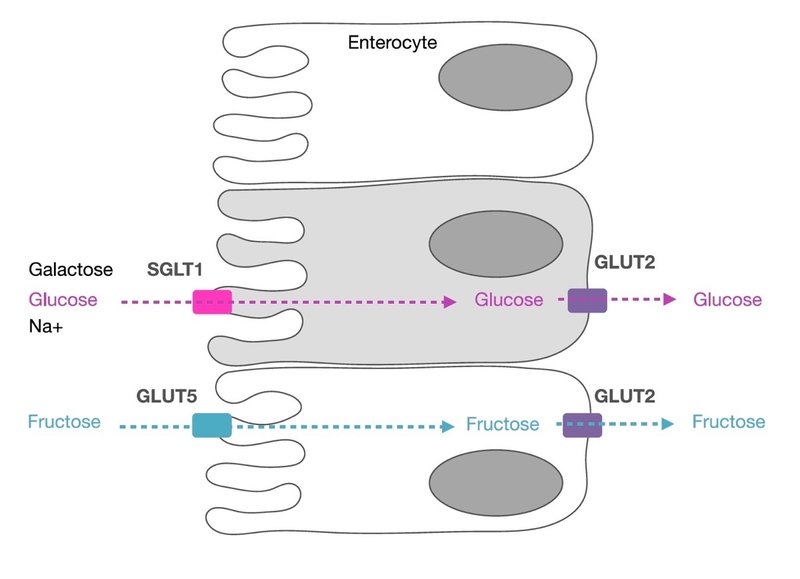 I wonder sometimes if some of my GI distress is caused by preservatives and/or additives in some of the gel/gu/electrolyte products. There biggest effect is going to be how they alter the osmolality (concentration) of the solution. Anything added to the solution, preservatives, electrolytes, flavoring, coloring all adds up. The issue is when companies do not account for that. Most medium calorie (70-90calories/16 ounces or ~4% carbohydrate solution) are going to be well under the concentration gradient and be easily absorbable. You’ll see most sports nutrition companies particularly Gu, Skratch Labs, Clif, Nuun offer something in this range, and take these things into account. Other companies that add things for mass appeal (gatorade has fallen into this trap before) like making them sweeter, colored, longer shelf life, run into those issues and are more likely to cause GI issues. Thanks for you comment. You’re correct that there have been numerous cycling and triathlon studies done over the years (there’s a ton of money in those sports industries to help drive them). Jeukendrup, who I actually heavily reference here also did a lot of those cycling specific studies and still found it an interesting enough question to ask it about running/ultra running as well. Running and particularly MUT have taken a good bit of that data and applied it to the sport, and although there are similarities there are also numerous differences. The mechanical stress of running and how it impacts your bodies ability to digest and absorb food is quite difference than being on the bike for example, and that jostling impacts splanchnic hypoperfusion and hormone secretion (specifically ghrelin and peptide YY) that impact nutrition while on the run. Adding in the total duration of many ultra races is another consideration that although has been looked at in ironman participants some also sets these research questions apart. Great article! One thing that’s missing though is that actually both mechanical and chemical digestion start in the mouth already. 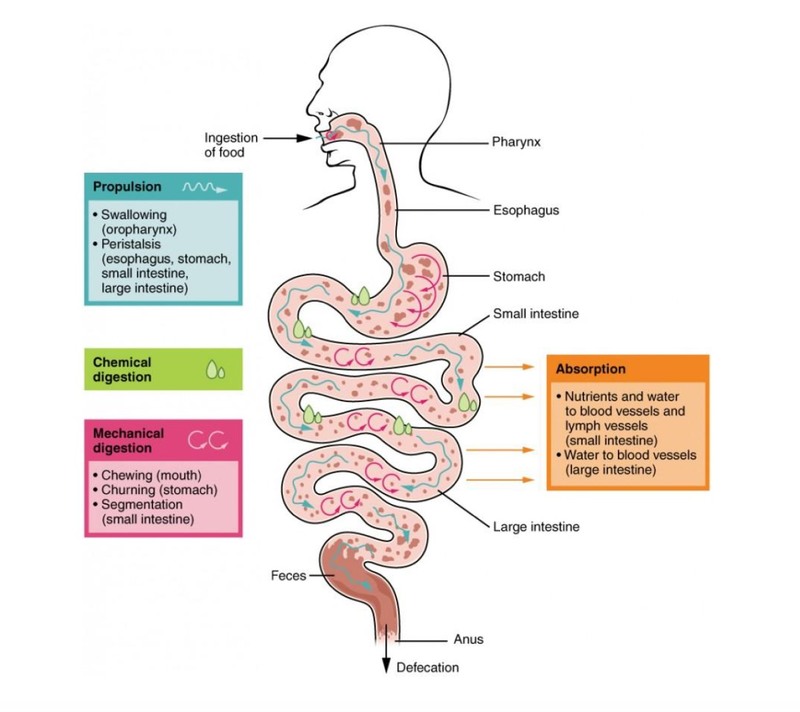 Thoroughly breaking down solid food through masticating and mixing it with the digestive enzymes present in saliva makes everything easier for the rest of your digestive system. 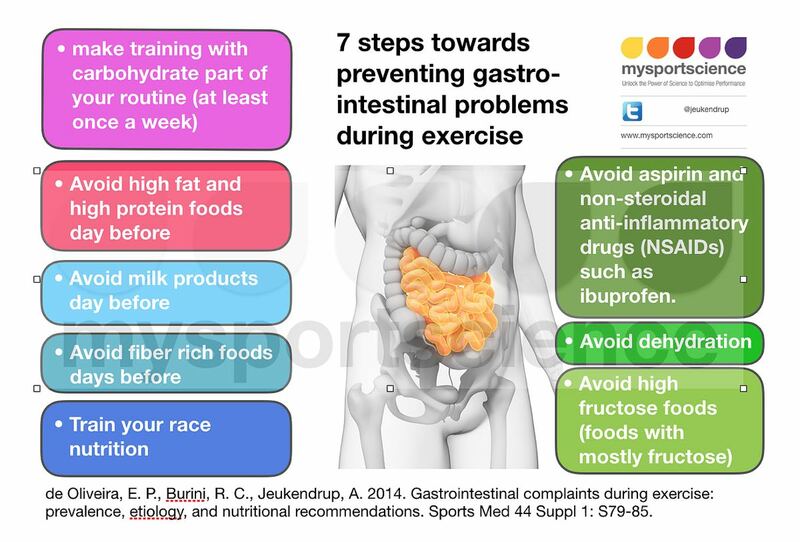 Probably not that important if you ingest mainly gels…but keeping those in your mouth longer instead of immediately swallowing them can have other performance-enhancing effects not related to digestion. John, I wasn’t even going to write anything (and if Meghan and Bryon will entertain my comment), but I’d love to know your background. I’ll give you the benefit of the doubt that you’re both either a triathlete or cyclist and ultrarunner. Because I would hope you’d be part of both or all 3 camps if you’re making such comments. I just rode 110km in cool weather, drank less than 1L of water, ate 2/3 Clif Bar, a Snickers because ‘Hungry, why wait’ and was fine. But for the mountainous 100-165km races I run, I would never be so indifferent as to my nutrition. What works in cool weather can be the worst idea in hot weather, and after 10-15 hours, all bets are off for many runners. Running simply produces higher sweat rates not seen in swimming and on ‘the windy bike,’ so no, it’s not as simple as you posit. Triathlons of the garden “Ironman” kind and bike races, except multi-day bike races, which are rare, don’t have to contend with the length of time we are often covering in ultras. In swimming and biking, HR is quite low compared to running, even downhill. There is no ‘coasting’, so Corrine’s excellent article takes that into consideration. There just isn’t the blood available to freely digest food when running, plus the jostling. Most anyone can get through a marathon leg in a tri, but 4 in a row with 10km climbing is a different animal. 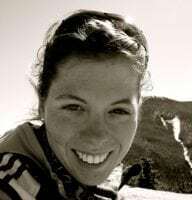 I’m not wholesale discounting the research and results put out by Tri and cycling folks, for I’ve trained with pro/elites in both worlds and gotten to know the top ultra runners in the world. If it was so easy, elites in MUT wouldn’t have DNF’s due to nutrition problems. But they do…maybe they should just read more, right? Thanks for your great question! The speed/effort level at which you are running definitely plays a role in how well you can tolerate fat while on the run. Nut butters are definitely a high caloric energy source that is rich in fat (2 tablespoons of peanut butter has approximately 16grams of fat). 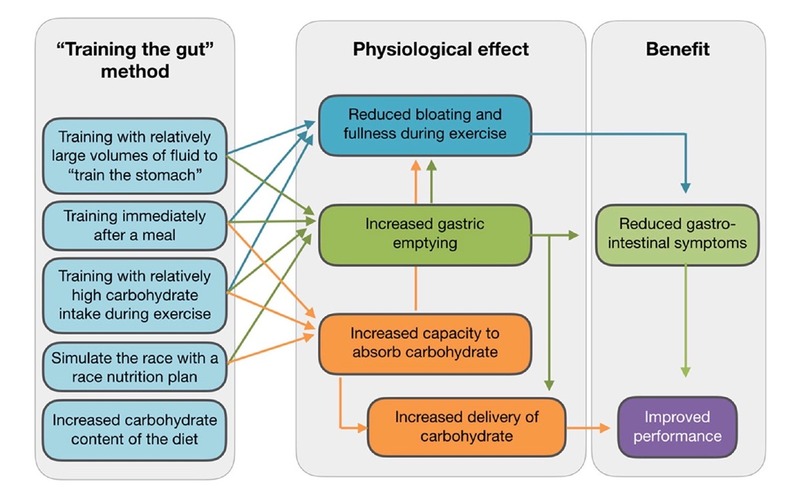 There’s actually been some research linking hydration and fat intake during an ultra to lower rates of GI distress, however in the study its impossible to separate the two, i.e. we can’t say it was the fat or the fluid intake that helped. In that study the runners reported taking in ~0.3-0.9 grams of fat/ kg of body weight / hour. For me at ~130lbs (59kg) that’s ~3 grams of fat/ hour. A PB&J sandwich at that rate doesn’t fall outside the possibility of safe things to digest. Most importantly it sounds like you have been practicing with PB&J in training runs, and that’s the real test. I would prep a plan B and C incase that PB&J does not seem appealing on race day so that your troubleshooting tool box is ready if you need it!